Ask The Bellwether: How do you spin a Batt? How do you spin a Batt? Because this needed to be rich in pictures to clearly show what I was doing, I ended up posting it as a flickr set with instructions accompanying each picture. 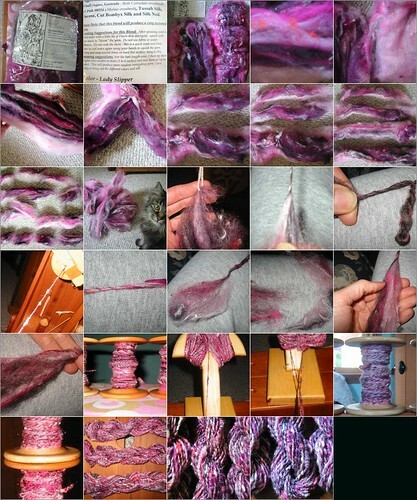 This flickr set is a pictorial on how to spin a Crosspatch Signature Batt -- or any highly textured, layered batt :-) it's all good! If you prefer to work from an abbreviated list, you can use these notes; or click the links for more details on one. Click the big picture above to see the full sized pictures on flickr, or to watch them as a slideshow. 16. remember - this spins into a textured yarn! 17. did I mention texture? Created with fd's Flickr Toys. And I can't tell you how pleased I was to run across this little flickr toy! Comments on this style of post? Comments or questions on spinning a Crosspatch Signature Batt? Feel free to comment here, on flickr, or email me. Amelia, I love your blog and all the information that you provide. You have been an inspiration for me. Twins is right -- right down to the cat "helpers" with the fluffs of wool. My husband has taking to calling those pieces, cat tails! LOL. *Thank you* for showing how you handle a layered batt in so much detail. And the ply-back picture for the singles yarn was really helpful, too -- I've wondered how to tell how much twist to use for singles! this was a very useful blog thank you !